There are three basic types of blood vessels: arteries, capillaries, and veins. They form a closed system of tubes that carry blood from the heart to the tissue cells and back to the heart. Have thinner walls and larger lumens than arteries Large veins have venous valves. The walls of arteries and veins are composed of three distinct layers. The tunica externa, the most superficial layer, is formed of dense irregular connective tissue that includes both collagen and elastic fibers. These fibers provide support and elasticity for the vessel. The tunica media, the middle layer, usually is the thickest layer. It consists of smooth muscle cells that encircle the blood vessel. The smooth muscle cells not only provide support but also produce changes in the diameter of the blood vessel by contraction or relaxation. The tunica intima, the deepest layer, forms the internal lining of blood vessels. It consists of a simple squamous epithelium, called the endothelium, supported by thin layers of areolar connective tissue containing elastic and collagen fibers. The walls of arteries and veins have the same basic structure. However, arterial walls are thicker because their tunica media contains more smooth muscle and elastic connective tissues as an adaptation to the higher blood pressure found in them. The tunica media of veins possesses very little smooth muscle, which leads to a much thinner wall. Veins possess larger lumens than arteries; as a result, they can hold a larger volume of blood. 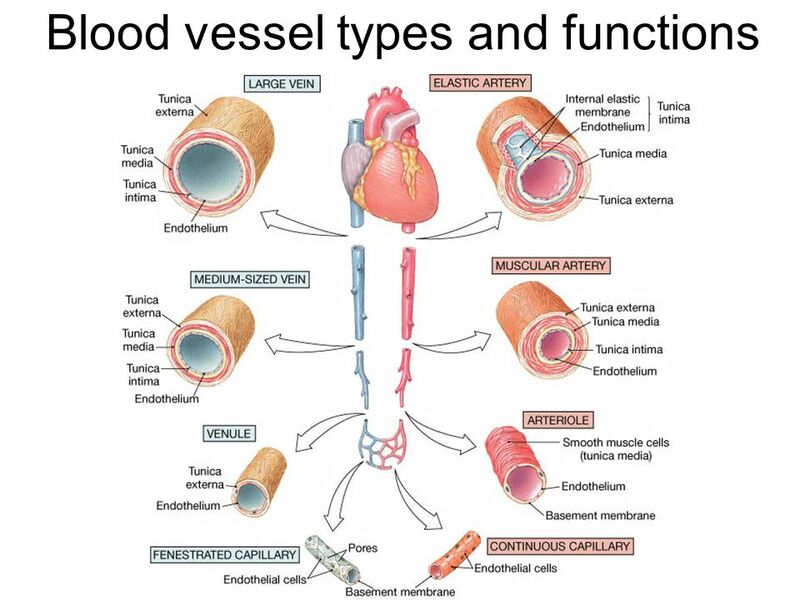 Another difference is that large veins, but not arteries, contain valves formed of endothelium. Venous valves prevent a backflow of blood. Compare the structure of arteries and veins in. Arteries carry blood away from the heart. They branch repeatedly into smaller and smaller arteries and ultimately form microscopic arteries called arterioles (ar-te’-re-ols). As arterioles branch and form smaller arterioles, the thickness of the tunica media decreases. The walls of the smallest arterioles consist of only the tunica intima and a few encircling smooth muscle cells. Arteries, especially the arterioles, play an important role in the control of blood flow and blood pressure. Arterioles connect with capillaries, the most numerous and the smallest blood vessels. A capillary’s diameter is so small that RBCs must pass through it in single file. The walls of capillaries consist of an endothelium supported by a layer of areolar connective tissue. These extremely thin walls facilitate the exchange of materials between blood in capillaries and tissue cells. The distribution of capillaries in body tissues varies with the metabolic activity of each tissue. Capillaries are especially abundant in active tissues, such as muscle and nervous tissues, where nearly every cell is near a capillary. Capillaries are less abundant in connective tissues and are absent in some tissues, such as cartilage, epidermis, and the lens and cornea of the eye. Blood flow in capillaries is controlled by precapillary sphincters, smooth muscle cells encircling the bases of capillaries at the arteriole-capillary junctions. Contraction of a precapillary sphincter inhibits blood flow to its capillary network. Relaxation of the sphincter allows blood to flow into its capillary network to provide oxygen and nutrients for the tissue cells. The flow of blood in capillary networks occurs intermittently. When some capillary networks are filled with blood, others are not. Capillary networks receive blood according to the needs of the cells that they serve. For example, during physical exercise blood is diverted from capillary networks in the digestive tract to fill the capillary networks in skeletal muscles. This pattern of blood distribution is largely reversed after a meal. The continual exchange of materials between the blood and tissue cells is essential for life. Cells require oxygen and nutrients to perform their metabolic functions, and they produce carbon dioxide and other metabolic wastes that must be removed by the blood. wastes diffuse in the opposite direction. The capillary walls are so thin that materials can readily diffuse through them, and the junctions between these cells are not tight so fluid is able to move between the cells. Two opposing forces determine the movement of fluid between capillary blood and interstitial fluid: osmotic pressure and blood pressure. Osmotic pressure of the blood results from plasma proteins. Osmotic pressure tends to “pull” fluid from interstitial fluid into the capillaries by osmosis. Blood pressure against the capillary walls results from the force of ventricular contractions. It tends to push fluid out of the capillaries into the interstitial fluid. This type of transport, forcing substances through a membrane due to greater hydrostatic pressure on one side of the membrane, is known as filtration. After blood flows through the capillaries, it enters the venules, the smallest veins. Several capillaries merge to form a venule. The smallest venules consist only of endothelium and areolar connective tissue, but larger venules also contain smooth muscle tissue. Venules unite to form small veins. Small veins combine to form progressively larger veins as blood is returned to the heart. Larger veins, especially those in the upper and lower limbs, contain valves that prevent a backflow of blood and aid the return of blood to the heart. Because nearly 60% of the blood volume is in veins at any instant, veins may be considered as storage areas for blood that can be carried to other parts of the body in times of need. Venous sinusoids in the liver and spleen are especially important reservoirs. If blood is lost by hemorrhage, both blood volume and pressure decline. In response, the sympathetic division sends nerve impulses to constrict the muscular walls of the veins, which reduces the venous volume while increasing blood volume and pressure in the heart, arteries and capillaries. This effect compensates for the blood loss. A similar response occurs during strenuous muscular activity in order to increase the blood flow to skeletal muscles.